Sony officially announced an exclusive “God of War” and “God of War II” compilation to be released on Blu-ray Disc this holiday. The “God of War Collection” will come as a single-disc Blu-ray for Playstation 3. “The God of War” games were originally developed for PS2, but have been remastered to high-definition quality. The new Blu-ray Disc release will have a resolution of 1280×720 (720p) and run at 60 frames-per-second. “God of War Collection” will retail for $39.99, and bring Playstation Network trophy support to the game for the first time. 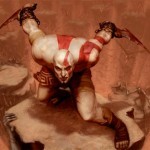 The two-game collection will get fans prepared of “God of War III” scheduled for release in March 2010. The remastered “God of War” titles were developed by Sony Computer Entertainment America – Santa Monica and Bluepoint Games.